This page is a catalog of historic and former fire service structures still standing in North Carolina. The criteria for inclusion: (a.) any former fire department building still standing of any age or (b.) any current fire department building older than 50 years of age. Contact Mike Legeros to contribute or correct information. Alamance Graham Old Town Hall 135 W. Elm Street 1911 Built 1911. Fire station relocated 1967. Presently Graham Historical Museum. Two-story building with two former bays. Alexander Taylorsville Old Sta 200 block Main Avenue Drive Benjy Grice photo. Alexander Wittenburg Old Sta Beside 45 Wittenburg Road Benjy Grice photo. Anson Wadesboro Old Sta 111 S. Washington Street 1920 Benjy Grice photo. Beaufort Belhaven Old Town Hall 210 E. Main Street 1911 Built 1911. Designed by W. T. Kirk. Fire station relocated ____. Two-story brick building with two (?) former bays. Presently museum on second floor and city offices on first floor. Listed National Register of Historic Places. Belhaven Memorial Museum photo. Sources: GE, IR. Beaufort Washington Old Town Hall 126 N. Market Street 1884 Built 1884. Relocated by 1924 to 223 N. Market Street. Two-story building with two former bays. Sources: PR, SM. Beaufort Washington Old Sta 217 N. Market Street Built by 1924. Relocated 1965 to 410 N. Market Street. Two-story building, with later one-story addition. Presently newspaper office. Sources: PR, SM. Bladen Hickory Grove Old Sta Highway 210 just north of Highway 701 Relocated 2004-05 to new building behind old building. Source: OH. Lee Kennedy photo. Bladen Tar Heel Old Sta Highway 87 Relocated ____ to Tar Heel Ferry Road just before the Cape Fear River. Source: OH. Brunswick Calabash Old Sta Thomasboro and Persimmon roads Relocated 1974 to 892 Persimmon Road next door. Brunswick Oak Island Old Sta SE 46th Street c2004 Built circa 2004. One-story building with one bay. Closed 2009. Brunswick Ocean Isle Old Sta 3 W Third Street 1995? Built 1995? Presently police station. Benjy Grice photo. Brunswick Shalotte Old Sta 113 Wall Street 1953 Built 1953. Relocated 2007. Benjy Grice photo. Brunswick Yaupon Beach Old Sta 101 E. Oak Island Drive 2009 Built 2009 by town of Oak Island. Vacated by YIFD in 2014. Brunswick Yaupon Beach Old Sta 104 Elizabeth Drive Opened 2014. Closed 2016. YBFD relocates to 1100 Caswell Beach Road. One-story metal building with two bays. Brunswick Yaupon Beach Old Sta 1100 Caswell Beach Road 2016 Built 2016 by town of Caswell Beach, as public services center. YBFD merged with Southport FD in 2018. Buncombe Black Mountain Old Municipal Building 223 W. State Street 1921 Built 1921. Fire station relocated 1987 to 106 Montreat Road. Two story brick building with 4,136 square feet and one former bay. Presently museum. Buncombe Weaverville Old Sta Built 19__. Relocated 1980. Buncombe Weaverville Old Sta Opened 1980. Relocated 2009. Burke Carbon City Old Sta 801 Carbon City Road 1970? Built 1970? Closed 1972 as CCFD. Became Morganton FD substation. Presently Morganton Public Safety Station 2. Burke Morganton Old Sta 203 W. Meeting Street 1947 Built 1947 (?). Opened 195_ as combination fire and police station. Relocated to two new stations in 1998. One-story concrete building with two bays and 9,482 square-feet. Burke Valdese Station 121 Faet Street 1932 Built 1932, section of building. Benjy Grice photo. Cabarrus Coldwater Old Sta Hwy 73 and Gold Hill Road Benjy Grice photo. Cabarrus Concord Sta 1 31 Church Street N. 1941 Benjy Grice photo. Cabarrus Flowes Store Old Sta Beside 8623 Flowes Store Road Benjy Grice photo. Cabarrus Pitts Old Sta 170 Pitts School Road 1971? Built 1971? Opened 1991 as Concord Station 5. Benjy Grice photo. Cabarrus Poplar Tent Old Sta Poplar Ten Rad near Rock Hill Church Road Benjy Grice photo. Caldwell North Catawba Old Sta Connely Springs Road and Cajah Mountain Road Benjy Grice photo. Caldwell Patterson Old Sta Near new station on Roby Martin Road Benjy Grice photo. Caldwell Sawmills Old Sta Beside new station on Highway 321 A Refurbished into town hall when town was incorporated in 1988. Benjy Grice photo. Carteret Atlantic Beach Town Hall 125 W. Fort Macon Road 1962 Built 1962. Fire station relocated next door 19__. One-story concrete (?) building with 4,842 square-feet. Carteret Cape Carteret Old Sta 102 Dolphin Street 1976 Built 1976. Relocated 1991 to 140 Sherwood Avenue. One-story concrete building with five bays and 4,264. Subsequently remodeled. Presently town hall. Carteret Emerald Isle Town Hall 7500 Emerald Drive 1975 Built 1975 (?). Fire station relocated 1992. Two former bays located in W. end of Town Hall. Presently offices. Sources: OH, PR. Carteret Morehead City Old Town Hall 801 Evans Street 1920 Built 1920 by Jones Brothers of Wilson, with R. D. Gladding consulting engineering. Fire station relocated in 2000? to 1406 Bridges Street. Two-story building of Florentine Renaissance Revival style with a single bay facing Evans Street. Vickie Mabe photo. Source: GE. Carteret Morehead City Old Sta 2 3308 Evans Street 1956 Built 1956. Two-story brick building with two bays. Closed 201_. Carteret Pine Knoll Shores Town Hall 100 Municipal Circle 1974 Built 1974. Fire station relocated in 2004 to 314 Salter Path Road. One-story building with three bays and 5,930 square-feet. Carteret Sea Level Old Sta Highway 70 E. Relocated 1971 to 647 Highway 70. Former restaurant. One-story concrete building with no bays. Presently unoccupied. Carteret Stella Old Sta Off Stella Road Relocated 19__ to 314 Morris Town Road. One-story wood building with two (?) bays. Carteret Wildwood Old Sta Highway 70 W. Built 19__. WFD merged with Morehead City FD in 201_. Catawba Catawba Town Hall 108 N. Main Street Fire station relocated 19__. Google Maps photo. Catawba Conover City Hall 101 1st Street E. Fire station relocated 1996 to 1225 Conover Boulevard E. .
Catawba Hickory Old Municipal Building 30 3rd Street NW 1922 Built 1922 with Charles C. Hook of Charlotte as architect. Fire station relocated 1961 to 19 Second Street Drive. Fire station bays converted to City Council chambers. City Hall relocated 1977. Two-story building with two former bays. Presently community theater. Sources: GP, IR, SM. Catawba Hickory Sta 1 19 Second Street Drive NE 1961 Built 1961. Reconstructed from an old wooden two-story building that housed firefighters. It was renovated again and dedicated in 2002. Catawba Hickory Old Sta 3 1400 block 1st Avenue SW Presently commercial space. Sources: PR. Catawba Long View Old Town Hall 139 24th Street SW Fire station opened 1953. Fire station relocated 1994 (?) to 2404 1st Avenue. One-story brick building presently occupied by Public Works department. 4,336 square feet. Long View Fire Department photo. Catawba Mount Holly Old Sta 131 S. Main Street 1962? Built 1962? Relocated 200_. Correct building? Catawba Viewmont Old Sta 23rd Avenue NE Fire department organized 1954. Chatham North Chatham Old Sta 2 1441 Farrington Road Relocated 2001 (?) to 1442 Farrington Road. Presently occupied by emergency medical provider. Google Maps photo. Chatham Siler City Town Hall 311 N. Second Avenue. 1940 Built 1940. Fire station relocated 1961 to 310 N. Chatham Avenue. Building includes two former bays. Siler City photo. Chowan Edenton Old Sta 113 W. Water Street 1920 Built circa 1920. Fire station circa 1927. Relocated to Municipal Building by early 1930s. One-story brick building. Built as auto repair garage. Presently commercial establishment. Columbus Bolton Old Sta 221 South 9th Street Relocated 19__ to 225 Ninth Street. Presently town hall. Source: IR. Columbus Chadbourn-Klondyke Old Sta 200 block E. 1st Avenue Relocated __ to the 200 block of N. Wilson Avenue. Presently occupied by public works department. Lee Kennedy photo. Craven Bridgeton Old Town Hall 509 B Street 1923 Built 1923. Fire station relocated 19__. One-story brick building with stucco exterior with 900 square-feet and one former bay. Presently privately owned and unoccupied. Craven Bridgeton Old Sta 408 Bridge Street Closed 200_. Presently Tri-Community fire station. Craven Cove City Old Sta 102 N. Main Street 1979 Built 1979. Relocated by 2000. One-story block building with two former bays and 3,375 square feet. Presently library. Craven Number 6 Township Old Sta 1309 Old Cherry Point Road Relocated ? Two-story block building with two former bays. Presently garden supply store. Source: OR, PR. Craven Number 9 Township Old Sta 3800 block W Highway 55 1968 Built 1968. Relocated 1990. One-story block building with two former bays. Presently house interior decorating company. Google Maps photo. Cumberland Bonnie Doone, Sta 9 Old Sta 5091 Santa Fe Drive 1976 Built 1976. Expanded 1986. Closed 1996. One-story concrete and masonry building with three bays and 10,148 square-feet. Presently Fayetteville Fire Station 9. Cumberland Bonnie Doone, Sta 8 Old Sta 140 Swain Street 1958 Built 1958. Relocated 1986 to 5091 Santa Fe Drive. One-story block building with seven bays and 4,062 square-feet. Presently garage. Sources: IR, OH, PR, TR. Cumberland Bonnie Doone, Sta _ Old Sta 402 Brunswick Road 1963 Built 1963. Closed 1976. One-story block building with two bays and 3,368 square-feet. Presently auto repair establishment. Cumberland Carver's Creek, Sta 15 Old Sta 4811 Rosehill Road 1956 Built circa 1956. Relocated 1976 to 6989 Ramsey Street. One-story block building with two bays. Presently auto repair establishment. Cumberland Cotton, Sta 4 Old Sta 4776 Cameron Road 1958 Built 1958. Relocated circa 1984 to 512 Calico Street. One-story block building with four (?) former bays and 8,188 square-feet. Sources: IR, OH, PR, TR. Cumberland Cumberland Road, Sta 5 Station 3543 Cumberland Road 1955 Built circa 1955. One-story brick and block building with six bays and 5,490 square-feet. Sources: IR, OH, PR, TR. Cumberland Eastover, Sta 1 Old Sta 4021 Dunn Road 1956 Built circa 1956. Relocated 1978 to 3405 Dunn Road. One-story brick building with three bays and 2,475 square-feet. Presently unoccupied. Cumberland Fort Bragg Old Sta 3 Butner Road and Ogden Street Relocated 2004 to Longstreet Road. One-story wood building with three bays. Presently unoccupied and scheduled for demolition. Cumberland Hope Mills Old Sta 5511 W. Patterson Street 1948 Built 1948. Relocated 1983 to 5770 Rockfish Road. One-story block building with four former bays and 2,415 square-feet. Presently senior center and professional organization office. Sources: IR, OH, PR, TR. Cumberland Lafayette Village, Sta 17 Old Sta 1 301 Hope Mills Road 1964 Built 1964. Closed 2001 as Lafayette Village fire station. One-and two-story story block building with 6,078 square-feet and four bays. Presently Fayetteville Fire Station 12. Sources: IR, OH, PR, TR. Cumberland Lafayette Village, Sta 17 Old Sta 2 6701 Bailey Lake Road 2001 Built 2001. Closed 2004 as Lafayette Village fire station. One-story metal and brick building with three bays and 9,124 square-feet. Presently Fayetteville Fire Station 17. Sources: IR, OH, PR, TR. Cumberland Lake Rim, Sta 11 Old Sta 7690 Raeford Road 1992 Built 1992. Closed 2004 as Lake Rim fire station. One-story concrete building with four bays and 11,132 square-feet. Presently Fayetteville Fire Station 11. Sources: IR, OH, PR, TR. Cumberland Lake Rim, Sta 11 Old Sta 7720 Hazelwood Avenue 1952 Built 1952. Relocated 1992 to 7690 Raeford Road. One-story brick building with six former bays and 5,264 square-feet. Presently church. Sources: IR, OH, PR, TR. Cumberland Manchester Old Sta 1475 E. Manchester Road 1962 Built 1962. Closed 19__. One-story block building with four bays and 2,640 square-feet. Presently storage building for Spring Lake Fire Department. Sources: IR, OH, PR, TR. Cumberland Pearces Mill, Sta 3 Old Sta 1722 Gillespie Street 1955 Built 1955. Relocated 1979 to 2998-A Gillespie Street. Two-story block building with three former bays and 2,500 square-feet. Presently HVAC business. Sources: IR, OH, PR, TR. Cumberland Raeford Road, Sta 6 Old Sta 105 Faison Avenue 1952 Built 1952. Closed circa 1997. One-story block building with two bays and 999 square-feet. Presently auto repair establishment. Sources: IR, OH, PR, TR. Cumberland Spring Lake Old Town Hall 11 Spring Avenue 1950 Built 1950. Relocated 1978 to 200 Ruth Street. One- and two-story block and brick building with 4,685 square-feet. Presently police substation. Sources: IR, OH, PR, TR. Cumberland Vander, Sta 2 Old Sta 3509 Clinton Road 1955 Built circa 1955. Closed 19__. Brick and block building with 9,560 square-feet. Cumberland Westarea, Sta 10 Old Sta 3816 Murchison Road 1955 Built 1955. Relocated 1983 to 4820 Rosehill Road. One-story block building with 4,788 square-feet. Presently church. Dare Kitty Hawk Old Sta 983 W. Kitty Hawk Road 1967 Built by 1967. One-story metal building with four bays. Relocated 2007 to 965 W. Kitty Hawk Road. Presently Public Works building. Dare Manteo Old Sta 309 Budleigh St 1941 Built 1941. Closed 1974 as Manteo FD when department merged with Wanchese FD to form Roanoke Island FD. Relocated 1990 to Highway 64. Two-story stucco over block building with 1,785 square-feet and two bays. Presently privately owned. Davidson Lexington Old Sta 1 8 W. First Street 1913-23 Built 1913-1923. Two-story brick building with two bays. Relocated 1936 to 22 W. Center Street. Subsequently used as machinery and welding shop. Presently unoccupied and used as storage. Sources: IR, PR. Davidson Lexington Town Hall 28 W. Center Street 1936 Built 1936. One-story brick (?) building with two (?) former bays. Fire station relocated 1989 to E. Center Street. Remodeled 1991 with other adjoining municipal buildings. Presently part of City Hall. Sources: IR, PR. Davidson Thomasville Old Town Hall 7 W. Guilford Street 1938 Built circa 1938. Two-story brick and marble building with two former bays on left side of building. Relocate 1977 to 712 E. Main Street. Presently police station. Source: IR, PR. Davidson Thomasville Old Sta 305 Randolph Street Relocated by 2004 to Highway 109 South. One-story building with two former bays and 4,800 square-feet. Presently community college education center. Sources: IR, PR, TR. Davidson Wallburg Old Sta Motsinger Road ? 1954 Built 1954. Relocated 1997 to 121 Georgetown Road. One-story building with 3,500 square-feet. Presently renovated as additional classroom space for neighboring Wallburg Elementary School. Google Maps photo. Duplin Calypso Old Sta South East Center Street 1913 Built 1913. Relocated 1979 next door to 109 S. East Center Street. Source: OH. Duplin Chinquapin Old Sta Firehouse Road Relocated 1999 nearby to _____ Firehouse Road. Source: OH. oogle Maps photo. Duplin Northeast Old Sta Highway 41 Relocated 1999 nearby to ____ Highway 41 after building damaged by Hurricane Floyd. Source: OH. Duplin Pleasant Grove Old Sta Red Hill Road Relocated 2001 across the street to 1757 Red Hill Road. Sources: IR, OH. Google Maps photo. Duplin Teachey Old Sta Highway 117 South Relocated circa 2000 next door to ___ Highway 117 South.. Two-story building with two bays. Source: OH. Duplin Warsaw Old Town Hall 111 W. College Street 1925 Built 1925. Fire station relocated 1970s? Source: OH, TR. Durham Bahama Old Sta 1426 Bahama Road 1960s Built 1960s. Relocated 2005 to 1814 Bahama Road. Two-story brick building with five bays and 4,302 square-feet. Presently used as fire department storage. Sources: PR, TR. Durham Bethesda Old Sta 1720 S. Miami Boulevard 1960s Built 1960s. Relocated 1982-83 next door to 1724 S. Miami Boulevard. One-story brick building with two bays. Presently used as apparatus storage for fire department. Sources: PR, TR. Durham Bethesda Old Sta 1 1724 S. Miami Boulevard 1983 Built 1983. Taken over by Durham County FD in 2013. Durham Bethesda Old Sta 2 7305 Leesville Road 1988 Built 1988. Taken over by Durham County FD in 2013. Durham Durham Sta 5 2212 Chapel Hill Road 1960 Built 1960. Durham Durham Station 2 1001 Ninth Street 1951 Built 1951. Two-story brick building with 17,488 square-feet and four bays. Sean Boone photo. Durham Durham County Old Sta 81 4716 Old Page Road 1986 Built 1986. Opened 2015. DCFD merged with Durham FD in 2018. Durham Durham County Old Sta 82 1724 S. Miami Boulevard 1983 Built 1983. Opened 2013. Closed 2018. Durham Durham County Old Sta 83 1409 Seaton Road 1976 Built 1976. Opened 2015. DCFD merged with Durham FD in 2018. Durham Durham County Old Sta 84 7305 Leesville Road 1988 Built 1988. Opened 2013. Closed 2018. Durham Durham County Old Sta 85 4200 Farrington Road 1984 Built 1984. Opened 2015. Closed 2015. Durham Lebanon Old Sta 226 Milton Road Relocated ____. One-story brick building with five bays and 7,833 square-feet. Presently EMS station. Sources: PR, TR. Durham Parkwood Old Sta 1 1409 Seaton Road 1976 Built 1976. Taken over by Durham County FD in 2015. Durham Parkwood Old Sta 2 4200 Farrington Road 1984 Built 1986. Taken over by Durham County FD in 2015. Durham Parkwood Old Sta 3 4716 Old Page Road 1984 Built 1984. Taken over by Durham County FD in 2015. Forsyth Dobson Old Sta Crutchfield Street 1965 Built 1965. Relocated 2000 or later. Google Maps photo. Forsyth Walkertown Old Sta 5135 Main Street 1953? Built 1953? Relocated 1999 to 5225 Main Street. Occupied by consignment shop in 2001. Present status unknown. Google Maps photo. Forsyth Winston-Salem Station 7 100 Arbor Road 1951 Built 1951. Two-story brick building with two bays. Remodeled and expanded in 2016-2018. Forsyth Winston-Salem Station 8 2417 Reynolda Road 1957 Built 1957. Gaston Agriculture Center Old Sta Dallas Cherryville Highway and Old NC 277 Loop Benjy Grice photo. Gaston Alexis Old Sta 1 4227 Charles Raper Jonas Highway (Highway 27) Benjy Grice photo. Gaston Belmont Old Sta 23 S. Main Street 1905 Built 1905. Presently restaurant. Source: TR. Gaston Chapel Grove Old Sta 111 Camp Rotary Road Now Crowder's Mountain fire station. Benjy Grice photo. Gaston Cherryville Old Town Hall 109 E. Main Street 1911 Built 1911. Fire station relocated after 1943. Two-story brick building. Presently museum. Sources: GP, SM. Gaston Cherryville Old Sta 116 S. Mountain Street 1940 Built after 1943, relocated 2008. Benjy Grice photo. Gaston Community Old Sta 156 Woodlawn Avenue 1960 Built 1960. Presently support building for educational institution. Source: TR. Gaston Dallas Old Sta W. Church Street and S. Oakland Street Benjy Grice photo. Gaston East Gastonia Old Sta Ozark Avenue near I-85 Benjy Grice photo. Gaston Gastonia Old Sta 240 W. Franklin Boulevard 1926 Built 1926 as City Hall. Fire station relocated 1953. Sources: GP, SM. Gaston Gastonia Old Sta 1 117 W. Second Street 1953 Built 1953. Relocated 2002. Two-story brick building with three bays and 9,936 square-feet. Presently city radio facility. Gaston Gastonia Old Sta 3 1502 W. Franklin Boulevard 1952 Built 1952. Relocated 2002. Two-story brick building with two bays and 3,276 square-feet. Presently car dealership. Gaston Gastonia Old Sta 4 1012 S. New Hope Road Relocated 2002. Presently grocery and cafe. Gaston Gastonia Old Sta 8 111 Camp Rotary Road Built as Chapel Grove FD. Opened 19__. Relocated 2002. Benjy Grice photo. Gaston Lowell Old Sta 101 W. First Street 1958 Built 1958. Relocated 1992. Source: OH..
Gaston Lucia-Riverbend Old Sta Lucia-Riverbend Highway near Stanley-Lucia Road Benjy Grice photo. Gaston Mount Holly Old Sta 309 N. Main Street 1963 Built 1963. Benjy Grice photo. Gaston Rhyne Old Sta W. Davidson Street near I-85 Benjy Grice photo. Gaston South Gastonia Old Sta York Highway (Highway 321) and Davis Heights Drive Presently Crowders Mountain fire station. Benjy Grice photo. Gaston South Point Old Sta 2000 block South Point Road Benjy Grice photo. Gaston Stanley Old Sta Downtown Presently police station. Benjy Grice photo. Granville Butner Old Public Safety Center 701 Central Avenue Relocated ? One-story building with three bays. Presently utilized by Butner Public Safety. Granville Oxford Old Sta Williamsboro Street Occupied 1956. Relocated 1993 to McClanahan Street. Granville Stovall Old Sta Highway 15 Lee Wilson photo. Greene Hookerton Old Sta Downtown, maybe Main Street (?) Relocated ____ about two blocks up the street. Two-story building. Guilford Bessemer Old Sta 610 Elwell Avenue 1940 Built 1940. Closed 19__. One-story concrete building with one former bay and 2,814 square-feet. Presently barber and beauty shop. Sources: IR, PR, SM. Guilford Colfax Old Sta Market Street Relocated 19__ to 9414 Highway 421. One-story brick and block building with two bays. Presently garage. Guilford Fire District 14 Old Sta 820 Franklin Boulevard 1960 Built 1960. Closed 2005. One-story wood building with 4,255 square-feet and two bays. Presently Greensboro Station #56. Sources: IR, PR, OH. Guilford Greensboro Sta 7 1064 Gatewood Avenue 1958 Built 1958. One-story brick building with two bays. Google Maps photo. Guilford Greensboro Sta 49 4302 West Friendly Avenue 1958 Built 1958. Formerly Greensboro Station 9. One-story building with two bays. Google Maps photo. Guilford Greensboro Sta 10 4208 High Point Road 1958. Built 1958. Formerly One-story building with two bays. Google Maps photo. Guilford Greensboro Old Sta 17 4614 Lake Brandt Road 1973 Built 1973. Opened November 12, 1984. Relocated November 9, 1987 to 4504 Lake Brandt Road. One-story brick residence used as temporary station. With no apparatus storage area, each firefighter pulled a two-hour night watch. Presently owned by private school. Source: IR. Guilford Guilford College Old Sta 6405 Old Oak Ridge Road 2000 Built 2000. Closed 2001 as Guilford College fire station. One-story brick building with 9,274 square-feet and three bays. In 2001, GCFD merged with the Greensboro Fire Department. The station presently serves as GFD Station 17. GFD photo. Guilford Guilford College Old Sta 201 College Road 1971 Built 1971. Closed 1987. One-story brick and frame building with 9,028 square-feet and four former bays. Presently church. Sources: OH, PR, TR. Guilford Guilford College Old Sta 302 College Road 1949 Built 1949. Relocated 1971 to 201 Guilford College Road. Two-story brick building with 3,988 square-feet and three bays. Presently residence. Sources: OH, PR, TR. Guilford Guil-Rand Old Sta 20 South Main Street 1986 Built 1986. Relocated 2001 to 10506 S. Main Street, Archdale. One-story brick building with 7,000 square-feet and three former bays. Presently auto repair establishment. Sources: IR, PR. Guilford High Point Old Sta 1 212 N. Wrenn Street 1905 Built 1905. Relocated 1975 to 508 N. Centennial Avenue. Two-story brick building with one former bay and 5,500 square-feet. Presently furniture galley. Listed on the National Register of Historic Places. Guilford High Point Old Sta 4 1329 N. Main Street 1925 Built 1925. Relocated 1986 to 213 Fisher Street. Two-story Dutch Colonial building with 2,388 square-feet and one former bay. Presently hair salon. Guilford High Point Old Sta 5 513 Oakview 1957 Built by 1957. Formerly Oakview Fire Department. Relocated 1986 to 3828 Johnson Street. One-story building with 5,422 square-feet and two bays. Presently municipal offices. Guilford Jamestown Town Hall 301 E. Main Street 1966 Built 1966. Fire station relocated 2001 to adjacent building at 301-B W. Main Street. Presently part of City Hall. Guilford Kernersville Old Sta 1780 Union Cross Road Presently used by religious organization. Guilford Oak Ridge Old Sta Linville Road Relocated 19__ to 8325 Linville Road. Used as temporary Oak Ridge Town Hall in 1999. Guilford Oakview Old Sta 513 Oakview 1957 Built by 1957. Closed 1960. One-story building with 5,422 square-feet and two bays. Guilford Pinecroft-Sedgefield Old Sta 22 5500 block Harvey Road Relocated 1984 to 5342 Vickery Chapel Road. One-story brick and block building with two bays. Presently storage. Sources: OH, PR. Guilford Pinecroft-Sedgefield Old Sta 25 1300 block Bennetts Chappel Road Relocated 2003 to 6519 Coltrane Mill Road. One-story brick and block building with three bays. Presently church. Sources: OH, PR. Guilford Stokesdale Old Sta Off Main Street Relocated 19__ to 8401 Highway 158. Presently HVAC company. Harnett Angier Old Sta 53 N. Broad Street West Relocated 1994 to 309 N. Broad Street. One-story metal building with brick face and three bays. Presently municipal vehicle storage. Source: PR. Harnett Angier Town Hall 55 N. Broad Street West 1957 Built 1957. Fire station relocated 19__ to 55 N. Broad Street E. . One-story brick building with two former bays facing side street. Presently houses town offices and police department. Source: PR. Harnett Coats Grove Old Sta 157 E. Lemon Street 1974 Built 1974. Relocated 2002 to 91 N. McKinley Street. Presently houses plumbing company. Sources: OH, PR. Harnett Coats Grove Old Sta 131 E. Main Street Opened as fire station in 1970. Relocated 1974 to Lemon Street. Old movie theater. Presently occupied by Public Works Department. Sources: OH, PR. Harnett Coats Grove Old Sta Highway 55 Presently abandoned. Sources: OH, PR. Harnett Dunn Town Hall 401 E. Broad Street 1966 Built 1966. Fire station relocated 19__ to 102 N. Powell Avenue. Two-story brick building with three former bays facing Edgerton Street. Harnett Flat Branch Old Sta Highway 210 Relocated 19__ to 2014 Elliott Bridge Road. Harnett Lillington Town Hall 823 S. Main Street 1935 Built 1935. Fire station relocated to adjoining building section in 19__. Two-story brick building. Presently houses police department and DMV office. Source: PR. Haywood North Canton Old Sta 1601 N. Canton Road Benjy Grice photo. Henderson Hendersonville City Hall 145 Fifth Avenue E. 1928 Built 1928, Erle Stillwell architect. Fire department relocated after 1949. Three-story brick building of Neoclassical design. Three former bays on right side of structure. Sources: GW, SM. Iredell Lake Norman Old Sta 1206 Brawley School Road Benjy Grice photo. Iredell Mooresville Old Sta 1 300 block N. Main Street Benjy Grice photo. Iredell Mount Mourne Old Sta 1500 block Mecklenburg Highway Benjy Grice photo. Iredell Statesville Station 1 316 S. Meeting Street 1954 Built 1954. Two-story brick building with 12,350 square-feet. Johnston 50-210 Old Sta 10570 Highway 50 North Relocated 1991 (?) to 50 Greenleaf Road. One-story concrete building. Johnston Archer Lodge Old Sta Covered Bridge Road, just south of Buffalo Road Relocated ____ to 6483 Covered Bridge Road. Google Maps photo. Sources: IR, OH. Johnson Benson Old Town Hall 101 N. Market Street Fire station relocated 1984 to 208 N. Elm Street. Two-story brick building with two former bays. Presently houses office and florist. Johnston Bentonville Old Sta Harperhouse Road Relocated ____ to 3167 Harperhouse Road. Sources: IR, OH. Johnston Bethany Old Sta Just N. of Shoeheel intersection Relocated ____ to 8399 Old Beulah Road. Sources: IR, OH. Johnston Clayton Old Town Hall 231 E. Second Street 1927 Built 1927. Fire station relocated 19__. 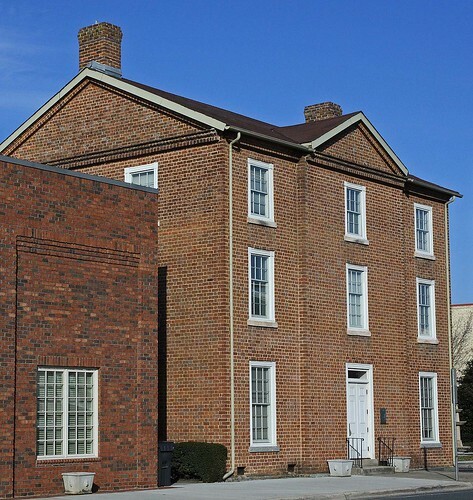 Three-story brick building originally housed town offices, courtroom, library, jail cells, and fire station. Five former bays faced Barbour Street. Presently called Town Annex. Johnston Clayton Old Sta 1 207 S. Barbour Street Relocated 2005 to 325 W. Horne Street. One-story block building with two bays. Johnston Corinth-Holder Old Sta 1 Located on school property Relocated ____. Small two-bay building. Source: OH. Johnston Elevation Old Sta 4299 Elevation Road Relocated ____ to 1825 Federal Road. Sources: IR, OH. Google Maps photo. Johnston Four Oaks Old Sta North Baker Street, just north of Railroad Street Relocated ____ to 301 Keen Street. Google Maps photo. Sources: IR, OH. Johnston Kenly Old Town Hall 206 W. Second Street 1946 Built 1946. Fire station relocated 1998 (?) to 101 W. First Street. One-story brick building with two former bays. Johnston Micro Old Sta East Main Street Lee Wilson photo. Johnston Pine Level Old Sta 107 W. Pine Street Relocated 19__ to 110 W. Main Street. One-story brick building with two bays. Presently auto repair garage. Sources: OH, PR. Johnston Princeton Old Sta Beside 116 Pine Street Relocated 19__ to 501 W. Dr. Donnie H Jones Boulevard. One-story concrete building with two bays. Presently used for city storage. Lee Sanford Old Town Hall 143 Charlotte Avenue 1909 Built 1909. Fire station relocated 1984 to 512 Hawkins Avenue. Three-story brick building with two former bays. Listed on National Register of Historic Places. Lee Sanford Old Sta 2 1300 S. Horner Boulevard 1948 Built 1948. Relocated 1977 to 2220 Woodland Avenue. Two-story brick building with two former bays. Presently antique store. Lincoln Boger City Old Sta 2493 E. Main Street 1959 Built 1959. Expanded 1977. Relocated 2003. Benjy Grice photo. Lincoln Denver Old Sta 4600 block Highway 16 south of new station Benjy Grice photo. Lincoln North Brook Old Sta 996 Highway 274 Benjy Grice photo. Lincoln South Fork Old Sta Long Shoals Road and Southside Road Benjy Grice photo. Madison Hot Springs Old Town Hall Andrews Avenue Still used by fire department. McDowell Cross Cotton Mills Old Sta Webb Street Closed 1994. Source: OH. McDowell Marion Old City Hall 130 N. Logan 1931 Built 1931. Fire station relocated 1993 to 60 W. Court Street. Two story brick building with two former bays. Presently offices. Source: OH, PR. McDowell Old Fort Old Sta 102 S. Catawba Avenue Relocated 19__ to ___ Main Street. McDowell Old Fort Old Sta Main Street Relocated 1990s to ____ Main Street. McDowell Pleasant Gardens Old Sta 52 PG Baptist Church Road 1959 Built 1959? Relocated 1989? to Highway 70 west. Two-story brick building with two bays. Source: IR, PR. Mecklenburg Carolina Old Sta Providence Road West and Old Audrey Kell Road Benjy Grice photo. Mecklenburg Derita Old Sta 2715 W. Sugar Creek Road 1951 Built circa 1951. Closed as fire station in 1994-95. Continued operation as rescue squad. One-story brick building with three former bays. Presently printing company. Source: IR. Mecklenburg Long Creek Old Sta 6328 Beatties Ford Road 1946 Built 1946. Mecklenburg Newell Old Sta 8500 block Old Concord Road Service station with extra bay for fire engine. Benjy Grice photo. Mitchell Estatoe Old Sta 1126 [Highway name] Presently Spruce Pine FD Station 2. Mitchell Grassy Creek Old Sta Highway 226 Presently Parkway FD Station 2. Mitchell Spruce Pine Old Town Hall 288 Oak Avenue 1904 Built 1904. Relocated 19__. Two- and one-story building with stone exterior. Presently commercial office. Mitchell Spruce Pine Old Sta 138 Highland Avenue Two-story brick building attached to town hall. Presently municipal storage. Moore Pinehurst Fire Station 45 Community Road 1936 Built 1936. Former town hall. Two-story brick building. Moore Southern Pines Old Sta 106 Memorial Park Court 1977 Built 1977. Relocated 2002 to 500 W. Pennsylvania Avenue. Presently community center. Nash Bailey Old Sta Behind 6260 Main Street 1948 Built 1948. Relocated 19__ next door to 6270 Main Street. One-story brick building with two bays. Presently used by Public Works Department. Nash Bailey Old Sta 6270 Main Street 19__ Relocated 19__ one block west. One-story concrete and brick building with two bays. Presently used by Police Department. Nash Sharpsburg Old Sta 100 E. John J Sharpe Street Relocated ____. Presently municipal building. New Hanover Carolina Beach Old Sta 1331 Bridge Barrier Road 1998 Built 1998. Relocated 2002 to 9. S. Dow Road. One-story metal building with four bays. New Hanover Castle Hayne Old Sta 4844 Castle Hayne Road One-story "barn" behind subsequent station. New Hanover Castle Hayne Old Sta 4844 Castle Hayne Road One-story building with three bays. New Hanover Castle Hayne Old Sta 5311 Castle Hayne Road 1982 Built 1982. Transferred to New Hanover County FD in 2010. New Hanover Federal Point Old Sta 9 S. Dow Road 1975 Built 1975, though tax records say 1970. One-story building with additions over the decades. Relocated 2002 to 9815 River Road. Presently Carolina Beach fire station. Two- and one-story block building with five bays and 8,165 square-feet. Sources: IR, TR. New Hanover Federal Point Old Sta 9815 River Road 2002 Built 2002. Transferred to New Hanover County FD in 2010. New Hanover Fort Fisher Air Station Old Sta One-story building with two bays. Built 1945. Relocated ____ to 5636 Carolina Beach Road. Single-story block building with three bays and 1,551. Sources: PR, TR. New Hanover North Wilmington Old Sta 3805 US 421 c1988 Built circa 1988. Closed as NWVFD in 1993. Re-opened as New Hanover County FD in 1997. Relocated 19__ to 7375 Market Street. Two-bay building. Source: IR. New Hanover Ogden Old Stay 8310 Shiraz Way 1998 Built 1998. Transferred to New Hanover County FD in 2010. New Hanover Winter Park Old Sta 4800 Oleander Service station also used by WPVFD, from 1951 to 1954. New Hanover Winter Park Old Sta 4601 Park Avenue 1983 Built 1983 (?). Closed 2005. One-story brick building with four (?) bays and 5,161 square-feet. Closed October 31, 2005. WECT photograph. New Hanover Wrightsville Beach Old Sta 5 Live Oak Drive 1972 Built 1972. Closed 1984. One-story building. After the Causeway Bridge was constructed, the town built a station on Harbor Island to house a fire engine for the island. Station 1 at the time was located at the site of the S. water tower on Waynick Boulevard. Presently houses municipal offices. Sources: OH, PR. New Hanover Wrightsboro Old Sta 3515 N. Kerr Avenue 1952 Built 1950. Transferred to New Hanover County FD in 2010. Onslow Bear Creek Old Sta Bear Creek Road (?) Relocated ____ to 677 Bear Creek Road. One-story brick building with two bays. Onslow Half Moon Old Sta 4465 Gum Branch Road 1965 Built 1965. Relocated 1993? to 4835 Gum Branch Road. Source: OH, TR. Onslow Richlands Old Sta Relocated ____ to 113 N. Wilmington Street. Onslow Swansboro Old Sta 101 S. Fifth Street Relocated 1990. Orange Carrboro Station 301 W. Main Street 1954 Built 1954? Converted to office space for fire department by 1981. One-story brick building with two former bays. Presently part of fire station. Sources: PR, SM. Orange Chapel Hill Old Town Hall 100 W. Rosemary Street 1941 Built 1939 with WPA assistance. Atwood & Weeks, architects. Relocated 1963? to 403 Airport Road, now named Martin Luther King Jr. Boulevard. Two-story brick building with two former bays. Renovated in 1970s as a homeless shelter. Presently shelter. Listed National Register of Historic Places. Sources: GP, IR, PR, SM. Orange Chapel Hill Sta 1 403 Martin Luther King Jr. Blvd. 1962 Built 1962. Orange Chapel Hill Sta 2 1003 S. Hamilton Road 1952 Built 1952. Orange Orange County Old Sta King Street Relocated 19__ to 206 S. Churton Street. Pamlico Vandemere Old Sta Pennsylvania Avenue Relocated 19__ to __ Pennsylvania Avenue. Lee Kennedy photo. Pasquotank Elizabeth City Old Sta 305 E. Elizabeth Street 1960 Built 1960. Relocated by 1996 to 90 Halstead Boulevard. One-story building with three form bays. Living area at station was condemned and later removed. Presently Parks & Recreation facility. Source: IR. Pender Hampstead Old Sta Highway 17 just S. of Highway 210 Relocated early 1990s one mile northon Highway 17. Presently community building. Source: OH. Pitt Farmville Old Municipal Building 115 N. Main Street 1928 Built 1928. Fire department relocated 1958 to 123 N. Main Street. Presently fire department offices and museum. Pitt Greenville Old Municipal Building 118 E. 5th Street 1909 Built 1909. Fire department relocated 1939 to 5th and Green Streets. Two-story brick building with one former bay. Presently occupied by commercial tenants. Sources: OH, PR. Pitt Greenville Old Sta 2 1710 Chestnut Street 1930 Built 1930 (?). Opened 1952. Relocated 1977 to 2407 Memorial Drive. One-story building with 5,200 square-feet and two former bays. Presently American Legion building. Sources: IR, PR. Pitt Greenville Old Sta 2 2407 Memorial Drive 1977 Built 1977. Relocated 2000 to 2490 Hemby Lane. One-story building with 6,115 square-feet and two former bays. Presently county mental health facility. Sources: IR, PR. Pitt Greenville Old Sta 3 1400 Brownlea Drive 1963 Built 1963. Relocated 2002 to 2400 Charles Street. One-story building with 2,576 square-feet and two former bays. Presently city training center. Sources: IR, PR. Pitt Greenville Old Tower behind 1710 Chestnut Street 1943 Built 1943 (?). Closed 2005. Training Center opened 2005 at 3375 E. 10th Street. Sources: IR, PR. Polk Saluda Old Sta Main Street 1905 Built 1905. Relocated 19__ to Greenville Street. Listed on National Register of Historic Places. Polk Saluda Old Sta 63 Greenville Street Relocated 2003 to 191 Walnut Street. Two-story block building with four former bays. Polk Tryon Old Sta 291 N. Trade Street Opened 19__. Presently police station. Randolph Asheboro Old Sta 1 146 N. Church Street 1939 Built 1939 as part of City Hall. Relocated 1971 to 401 Church Street. Randolph County Library photo. Source: IR. Randolph Liberty Old Sta 221 Swannanoa Avenue Relocated ____ to 215 Swannanoa Avenue. Presently houses old fire truck. Liberty photo. Randolph Seagrove Old Sta 106 N. Broad Street Relocated 19__ to 281 E. Main Street. Presently pottery store. Robeson Deep Branch Sanchez Road Relocated 19__ 1246 Lowe Road. Used as community center circa 1996. Robeson Lumber Bridge Old Sta 220 Railroad Street Relocated 19__ to 303 W. Main Street. Presently town hall. Robeson Lumberton Old Sta 2 1100 N. Cedar Street 1930s Built 1930s? Relocated 1962 to 1305 Godwin Street. One-story brick section of former armory with four (?) former bays. Presently occupied by Recreation Department. Robeson Lumberton Old Sta 2 1305 Godwin Street 1962 Built 1962. Relocated 1983 to to 501 Bailey Road. One-story brick section of former municipal building with two former bays. Presently police station. Robeson Parkton Old Sta 28 David Parnell Street Relocated 19__ to 2704 West Parkton Tobermory Road. Presently town hall. Robeson Red Springs Old Sta 218 S. Main Street Built 19__ Relocated 1987 to 135 North Main Street. Presently police station. Robeson Roseboro Fire Station 301 Pleasant Street 1930s Built 1930s. Relocated 19__. Source: OH. Google Maps photo. Robeson Rowland Old Sta 206 W. Main Street Presently police station. Robeson Saint Pauls Town Hall 210 W. Blue Street 1968 Built 1986. Fire station relocated ? to 585 W. Mclean Street. One-story municipal building with three bays. Presently town storage. Robeson Shannon Old Sta Highway 71 North Relocated ____ next door. Presently used by fire department. Rowan China Grove Station 333 N. Main Street 1957 Built 1957. Benjy Grice photo. Rowan Faith Old Sta Near new station downtown Benjy Grice photo. Rowan Franklin Old Sta Near 3975 Statesville Boulevard Benjy Grice photo. Rowan Ellis Old Sta E. Ridge Road and Old Mocksville Road Benjy Grice photo. Rowan Landis Town Hall 136 N. Central Ave. Benjy Grice photo. Rowan Liberty Old Sta Stokes Ferry Road and Liberty Road Benjy Grice photo. Rowan Locke Township Old Sta Beside new station at 5405 Mooresville Highway Benjy Grice photo. Rowan Millers Ferry Old Sta 1555 Long Ferry Road 1954? Built circa 1954 as a two-bay station. Expanded in 19__. Relocated 1992 to 2650 Long Ferry Road. Rowan Rockwell Old Sta 202 E Main Street 1954 Built 1954 as municipal building and fire station with two bays. Relocated 1985 to 116 S. Cherry St. Source: TR. Rowan Rockwell Rural Old Sta 314 China Grove Highway 1945 Built 1945. Relocated 1996 to 320 Link Street. Source: TR. Rowan Salisbury Old City Hall 117 S. Lee Street 1896 Built 1896. City Hall relocated 19___. Fire station relocated 1965 to 514 E. Innes Street. Building also housed jail. One- and two-story building with 4,364 square-feet and three former bays. Presently retail establishment. Listed on the National Register of Historic Places. Rowan Salisbury Old Sta 2 1400 block S. Main Street 1942 Built 1942?. Relocated 1980 to 2312 S. Main Street. Single-story brick building with 2,280 square-feet. Presently storage for city (?). Rowan Salisbury Sta 3 1604 W. Innes Street 1953 Built 1953. Benjy Grice photo. Rowan West Rowan Old Sta 2840 Graham Road 1954 Built 1954. Relocated 1984. Source: OH. Rowan West Rowan Old Sta 67 780 Grampian Road 1961-62 Built 1961-62. Relocated 2004. Rear of building still used by fire department for storage. Front of building use as local food pantry. Source: OH. Chad Kiser photo. Rowan West Rowan Old Sta 68 13110 Mooresville Road 1981 Built 1981. Relocated 2009. Building and land reverted back to owners that originally donated property. Source: OH. Chad Kiser photo. Rutherford Cherry Mountain Old Sta 1 Bostic Sunshine Road near Duncans Creek Road Benjy Grice photo. Rutherford Forest City Old Sta Presently bank. Rutherford Forest City Old Sta Near E. Trade Street and N. Powell Street Built 19__ as a commercial structure. Opened 1976, relocated 1999. Part of remaining structure removed. Rutherford Rutherfordton Old City Hall 134 N. Washington Street 1925 Built 1925, or earlier (turn of the century?). Housed fire department by 1925. Fire department relocated after 1938. Two-story brick building with 8,503 square-feet. Presently inn. Firehouse Inn photograph. Sources: GW, IR, SM. Rutherford Spindale Old City Hall 400 Spindale Street 1916 Built circa 1916. Relocated 19__. Presently fabric retailer. Sources: IR, PR. Sampson Clinton Old Sta Ferrell Street Relocated 2000 (?) to ____ Wall Street. Presently abandoned. Source: OH. Sampson Newton Grove Old Sta Behind Hardees at the Circle. Relocated 1993 (?) to 301 Weeksdale Street. Presently used for town storage. Siren on old station still used. Sources: IR, OH. Sampson Salemburg Old Sta Just off Main Street near stoplight Relocated to ____ Main Street around 2003. Source: OH. Sampson Turkey Old Sta Highway 24 Relocated 2000 to Faison Road. Source: OH. Stanly Albemarle Old Sta Third and Main Streets Benjy Grice photo. Stanly Albemarle Sta 2 607 Concord Road Benjy Grice photo. Stanly Bethany Station 118 Bethany Road Built 1940. Benjy Grice photo. Stanly Endy Old Sta Highway 24/27 near new station Built 1952. Benjy Grice photo. Stanly New London Old Sta 112 W. Gold Street Benjy Grice photo. Stanly Richfield-Misenheimer Old Sta 134 N. Highway 49 Benjy Grice photo. Transylvania Hemby Bridge Old Sta 7602 Secrest Shortcut Road Benjy Grice photo. Union Monroe Old City Hall 102 W. Jefferson Street 1848 Built 1847-48 as jail. Housed jail until 1893. Housed steam fire engine (and nothing else?) by 1897. Converted to City Hall by 1914 and used until 1972. Fire department relocated to corner of Crowell Avenue W. and Hayne Street N. by 1922. Present use unknown. Listed on the National Register of Historic Places. NC Elmo photo. Sources: GP, IR, SM. Union Stallings Old Sta Old Monroe Road Relocated ____. Vance Henderson Station 2 205 N. Garnett Street 1908 Built 1908. The two-story brick corner building includes a combination clock, bell, and hose tower. By 1917, City Hall was sharing the space. By 1947, additional municipal buildings were added behind and beside the structure. In 1974, a new Station 1 was constructed at 211 Dabney Drive and the Garnett Street station was renumbered. Listed on the National Register of Historic Places. Wake Apex Old Town Hall 235-237 N. Salem Street 1912 Built 1912. Fire station opened circa 1927. Fire station relocated 1956 to 210 N. Salem Street. Two-story brick building with 5,822 square-feet and one former bay. Presently houses municipal offices. Listed on the National Register of Historic Places. Wake Bay Leaf Old Sta 11617 Six Forks Road, Raleigh 1967 Built 1967. Relocated 1983 to 11713 Six Forks Road. One-story concrete building with three bays facing Norwood Road. Presently unoccupied. Wake Cary Old Sta 1 100 N. Academy Street 1965 Built 1965. Closed 1992. One-story brick and concrete-block building with 5,200 square-feet and four former bays, three facing Academy Street and one basement bay facing Cedar Street. Presently fire administration office. Wake Cary Old Sta 2 100 block E. Cedar Street 1953 Built 1953. Closed 19__. One-story metal building with two former bays. Presently commercial structure. Wake Fairgrounds Old Sta 4120 District Drive 1992 Built 1992. Closed 1998 as Fairgrounds Fire Station. One-story brick building with three bays. In 1998, the Fairgrounds Fire Department merged with the Yrac Fire Department to create the Western Wake Fire Department. The station presently serves as Western Wake Station 1. Wake Fuquay-Varina Old Town Hall 131 S. Fuquay Avenue 1951 Built 1951. Fire station relocated 1978 to S. Fuquay Avenue. One-story brick building with 5,048 square-feet and one former bay. Presently occupied by Department of Motor Vehicles. Wake Fuquay-Varina Old Rural Fire Station 128 S. Fuquay Avenue 1965 Built 1965. Relocated 1978 to S. Fuquay Avenue. One-story building with 2,660 square-feet and two bays. Later used as EMS station. Wake Garner Old Sta 1 110 Pearl Street 1953 Built 1953. Relocated 1970 to 503 W. Main Street. One-story concrete building with 3,300 square-feet and four former bays. Presently community building. Wake Morrisville Old Sta 1 200 Morrisville-Carpenter Road 1960 Built 1960. Expanded, renovated, and reoriented over the years. Relocated 2012 to 200 Town Hall Drive. One-story concrete building with four bays. Still used by fire department. Wake Rolesville Old Sta 106 S. Main Street 1960 Built 1960. Relocated 1980 to 104 E. Young Street. Two-story concrete block building with 3,200 square-feet and two bays. Later used as EMS station. Presently occupied by a commercial tenant. Wake Six Forks Old Sta 1431 Lynn Road 1974 Built 1974. Closed 2002 as Six Forks fire station. Two-story metal building with 12,642 square-feet and eight bays. Original building measured approximately 50x50 feet with one story and three bays. In 2002, the Six Forks Fire Department merged with Bay Leaf Fire Department. Presently Bay Leaf Station 3. Also houses Six Forks Rescue. Wake Six Forks Old Sta 5305 Six Forks Road, Raleigh 1962 Built 1962. Relocated 1974 to 1431 Lynn Road. One-story concrete building with three bays. Presently EMS station. Wake Stony Hill Old Sta 2716 Durham Road, Wake Forest 1958 Built 1958. Relocated 1963 to 7025 Stony Hill Road. One-story metal building with two bays. Presently used as private storage. Wake Stony Hill Old Sta 7025 Stony Hill Road 1963 Built 1963. Relocated 2004 to 7037 Stony Hill Road. One-story concrete-block building with four bays. Presently unoccupied. Wake Swift Creek Old Sta 6115 Holly Springs Road, Cary 1962 Built circa 1962. Relocated 1983-84 to 6000 Holly Springs Road. One-story brick building with three bays. Presently unoccupied. Wake Wake Forest Old Town Hall 221 S. Brooks Street 1930 Built 1930. Fire station relocated 1973 to converted service station. Three-story (?) building with two former bays facing Owen Avenue. Presently houses Planning Department. Wake Wake Forest Old Sta 352 S. White Street 1966 Built 1966. Relocated to 430 E. Elm Street in 1986. One-story concrete block building with 2,048 square-feet and four former bays. Presently commercial property. Wake Wendell Town Hall 15 E. Fourth Street 1963 Built 1963. Fire station relocated 1984 to present-named 2960 Wendell Boulevard. One-story brick building with 6,689 and three former bays facing Pine Street. Wake Western Wake Old Sta 2 325 E. Durham Road 1963 SeeYrac old station. Wake Yrac Old Sta 325 E. Durham Road 1963 Built 1963. Closed 1998 as Yrac Fire Station. One-story brick and block building with 3,222 square-feet and three bays. In 1998, the Yrac Fire Department merged with the Fairgrounds Fire Department to create the Western Wake Fire Department. Closed 2007 as Western Wake Station 2. Presently private storage. Wake Zebulon Old Town Hall 111 E. Vance Street 1951 Built 1951. Fire station relocated 1974 to 113 E. Vance Street. Two-story brick and concrete-block building with 4,846 square-feet and two former bays. Presently police station. Warren Roanoke-Wildwood Old Sta Lizard Creek Road Relocated __ next door. Lee Wilson photo. Warren Warrenton Old Town Hall 211 S. Bragg Street 1912 Built by 1912 as City Hall. Fire station originally located in rear. Building also originally housed Mayor's office, jail, City Market, and Opera House. Closed 2004? when Warrenton's municipal fire department retired on July 1, 2004. Google Maps photo. Sources: GP, SM. Washington Plymouth Old Sta 1 132 E. Water Street 1970 Built 1970?. Relocated ? One-story brick building with one former bay. Presently town storage. Watauga Blowing Rock Old Town Hall 1036 Main Street 1952 Built 1952. Relocated 19__ to 189 Park Avenue. Two former bays facing Main Street. Presently Planning Department offices. Watauga Blowing Rock Old Sta 189 Park Avenue Relocated 2008 to 8001 Valley Boulevard. Watauga Boone Old Town Hall 140 S. Depot Street 1920 Built 1920 as auto repair garage. Opened as Town Hall in 1932. Relocated 1967 to 721 W. King Street. Two-story brick building with 4,847 square feet and three former bays. Presently ski shop. Source: OH, PR. Watauga Deep Gap Old Sta Stanley Miller Road off old Highway 421 Benjy Grice photo. Watauga Foscoe Old Sta 8599 Highway 105 Relocated 1990s to 9230 Highway 105. One-story building. Presently antique store. Source: OH, PR. Wayne Antioch Old Sta Highway 111 Relocated 19__ to 4682 Highway 111 North, just S. of old station. Sources: IR, OH. Wayne Dudley Old Sta Oberry Road just W. of Highway 117 Business Relocated early 1980s to 4533 Highway 117 South. Presently combination Sherriff's Department office and EMS Station. Sources: IR, OH, PR. Wayne Elroy Old Sta Behind 4597 Highway 70 E. 1955 Built 1955. Relocated 1970s to 4720 Highway 70 E. . One-story brick building with two bays. Presently used as storage. Sources: IR, OH, PR. Wayne Fork Old Sta 797 Highway 581 South Relocated 1980s to 884 Rosewood Road. Presently used as storage. Source: OH, PR. Wayne Mar Mac Old Sta 157 (?) Old Grantham Road Relocated 1980s to 583 Old Grantham Road. One-story brick building with four bays. Presently auto repair establishment. Sources: IR, OH, PR. Wayne Pikeville Town Hall 112 SW Railroad Street 1950 Built 1950. Relocated 1980-1981 to 120 Southwest Railroad Street. One-story concrete building with two bays. Source: PR. Wayne Pikeville-Pleasant Grove Old Sta 120 SW Railroad Street 1980-81 Built 1980-81. Relocated 20__ to 105 Southeast Railroad Street. Source: OH. Jesse House photo. Wayne Smith Chapel Old Sta 2700 block (?) Grantham School Road Relocated 1970s to 2843 Grantham School Road. One-story brick and block building with two bays. Presently empty or used as storage. Sources: IR, OH, PR. Wilkes Millers Creek Old Sta Near 4210 Boone Trail Benjy Grice photo. Wilkes Moravian Falls Old Sta Moravian Falls Road and Old Highway 17 Benjy Grice photo. Wilkes North Wilkesboro Fire Station Ninth Street 1956 Built 1956. One-story station with basement area and five bays, four above-ground. Source: PR. Wilkes North Wilkesboro Old Town Hall 801 Main Street 1939 Built 1939 with WPA assistance. Charles C. Benton & Sons of Wilson architect. Fire station relocated 1957 to 709 N. 9th Street. Three-story brick building with stone front and one former bay. Presently houses Police Department. Sources: GW, PR. Wilkes Wilkesboro Old Municipal Building 100 W. Street 1970 Built 1970. Fire station relocated 200_ to 400 S. Cherry Street. Two-story building with three former bays. Presently houses Police Department. Wilkes Wilkesboro Old Municipal Building 100 N. Bridge Street Relocated 1970 to 100 W. Street. Two-story brick building with one former bay. Presently office building. Wilson Elm City Old Sta 107 S. Railroad Street 1900 Built 1900. Opened 19__. Lee Wilson photo. Wilson Lucama Old Sta 111 Main Street 1953 Built 1953. Relocated 19__ to 102 Grove Street. One-story brick building with 4,058 square-feet and two (?) former bays facing Spring Street. GE - A Guide to the Historic Architecture of E. ern N. Carolina by by Catherine W. Bishir, Michael T. Southern, Jennifer F. Martin, UNC Press 1996. GP - A Guide to the Historic Architecture of Piedmont N. Carolina by by Catherine W. Bishir, Michael T. Southern, Jennifer F. Martin, UNC Press 2003. GW - A Guide to the Historic Architecture of Western N. Carolina by by Catherine W. Bishir, Michael T. Southern, Jennifer F. Martin, UNC Press 1999. SM - Sanborn Fire Insurance Maps, available online from NC LIVE. TR - Tax records for particular county. Photos by Mike Legeros unless credited otherwise.